Executive Chef Garry Payne started cooking at the Waterfront Restaurant in Cincinnati Ohio for Owner Jeff Ruby, well known for breaking away from its support ramps and floating down the Ohio River in 2011 where all 83 patrons were eventually rescued. Breaking away himself from Cincinnati and landing at Boston’s Grill 23 & Bar, Garry was awarded “Best Steak House” and “Best American Restaurant” by Boston Magazine. In 1994 Garry became the Executive Chef, opening the newly founded restaurant Stephanie’s on Newbury Street where he shinned with sophisticated comfort food, putting new twists on old classics. Garry eventually entered back into the Steak house scene as Executive Chef of 111 Chop House in Worcester MA. He was awarded “Best Steak house” and “Best Restaurant” by Worcester Magazine five years running. Serving only Prime cuts of beef and locally sourced ingredients for his signature specials the 111 Chop House became one of the premier restaurants in Western MA. Moving back to Boston in in 2005 Garry took the Chef position at the World renowned Four Seasons Hotel, the only Five Star, Five Diamond Hotel in all of New England. Working for several years at the prestige’s Bristol Lounge, Four Season Hotel and as the Banquet Chef, Four Seasons Hotel Garry catered to the likes of Mick Jagger of the Rolling Stones, Bono of U2, Top Sports Celebrities like David Ortiz and even Boston’s own Mr. Mark Walberg. Landing the Executive Chef Position of the Cohasset Harbor Resort in 2010, Garry was in charge of three restaurants, weddings, banquet events and creating a new Tapas and Wine Bar. 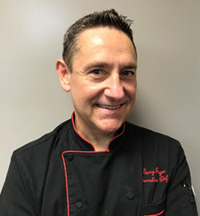 He is now proud to be the Executive Chef of Exchange Street Bistro focusing on locally sourced ingredients that are simply prepared to the highest standards for our guest’s satisfaction.